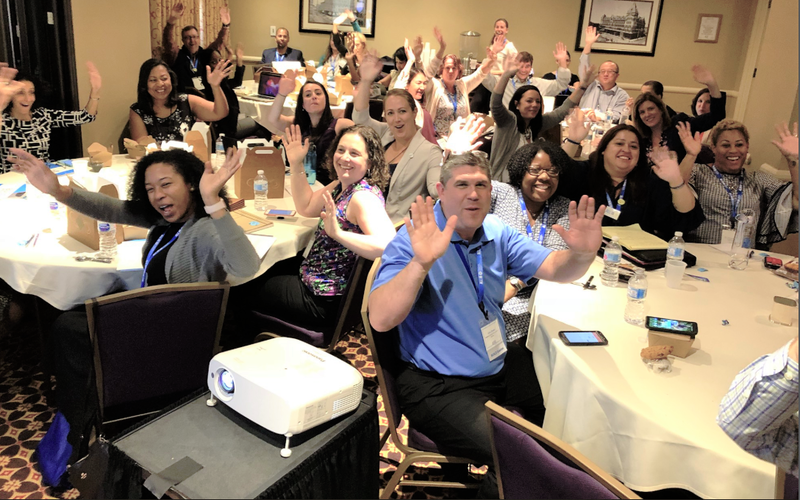 The All In National Meeting brought together 250 stakeholders from around the country that are at the forefront of the movement to improve community health and whole-person wellness through multi-sector partnerships working to share data. Read a summary of the meeting with commentary from attendees on Twitter! The meeting kicked off with five deep-dive workshops providing practical tools and guidance for tackling common challenges. These interactive half-day workshops included an in-depth review of a specific topic, led by subject matter experts. Attorneys from the Network for Public Health Law provided guidance on how policies and regulations such as HIPAA, FERPA, and 42 CFR Part 2 govern healthcare, education, and behavioral health data and impact consent. Participants also learned about the SAMHSA-sponsored, open-source Consent2Share consent management platform and had the opportunity to raise their own issues in breakouts. Presenters from the Michigan Public Health Institute explored health equity principles and terms and guided participants to think deeply about what using a health equity frame with data means and consider how an understanding of these concepts can be applied to their day-to-day work. This interactive workshop introduced participants to the principles and practices of Asset-Based Community Development (ABCD) and shared guidance on how to sustainably engage community residents and support them in using their power to create change. Representatives from ReThink Health, Quantified Ventures, and the Center for Community Investment outlined a range of alternative payment models and helped participants expand their knowledge of, comfort level with, and capacity to take advantage of different sustainable financing options. In this interactive workshop, Dr. Soma Stout shared practical tools and skills developed by 100 Million Healthier Lives to accelerate improvement in health, wellbeing, and equity. Over 50 presenters from local data sharing collaborations around the country and organizations that support them gave practical advice and spoke about lessons learned on topics including partnering with other sectors, tackling legal barriers, developing shared metrics, improving care coordination, utilizing neighborhood-level data for public health, using various data collection/screening/referral tools, and more. The presenters represented a geographically diverse range of stakeholders, with different roles including community advocates, epidemiologists, data analysts, health information technology specialists, physicians, academic researchers, local government, health educators, evaluators, and other partners from a variety of sectors. Presenters and audience members were eager to engage in energetic discussions about solutions and strategies to apply learnings and advance similar efforts in other communities. Attendees had the choice of joining one of 22 lively roundtable discussions that provided an opportunity to explore issues and solutions with others in an informal, small group conversation led by a leader with content expertise. Participants discussed what their communities were working on in areas like policy, communicating data, engaging residents and stakeholders, and utilizing tools for data collection and analysis. Day one of the meeting ended with a panel featuring representatives from two private health plans, who discussed why their organizations are compelled to address the social determinants of health for their members and how data plays a role in implementing and monitoring the success of those efforts. Panelists explained that with the majority of health outcomes being determined by factors outside of the health care system, it’s critical that they invest in the communities where people live and understand how issues like homelessness, unemployment, and food insecurity are impacting their members. They described how their health plans are conducting needs assessments for social determinants of health and leveraging integrated data systems to better understand members’ needs outside of the health care system and connect them to community services sand supports. All In leaders began day two by sharing their reflections about the first day and leading an interactive exercise to get initial reactions and feedback from attendees about their experience. Hilary Heishman, Senior Program Officer at RWJF, thanked participants for sharing, learning, and connecting to others through All In to accelerate our progress toward building a culture of health. She acknowledged that although the day-to-day work can be challenging at times, it’s the vision, perseverance, and innovation of local communities across All In that builds the value of the network and results in a greater collective impact. Dr. Tiffany Manuel, Enterprise Community Partners, Inc.
Dr. Tiffany Manuel’s thought-provoking plenary challenged us to ask the question: why hasn’t access to more data and evidence been the game changer many of us thought it would be? She made the case that when we are not careful in how we frame the conversation around the data we have, our attempts to build support can backfire and reinforce existing biases. Data itself will not make the case to the public and policymakers; it has to be embedded in a broader story that considers the people consuming it. Manuel explained common root causes of miscommunication and encouraged participants to use data build trust, make equity part of the conversation, focus on solutions and opportunities rather than problems, and connect the dots about how our issues apply to people’s lives. She concluded with a call-to-action to change the way we communicate data so that we can help build public support for scaling health programs, policies and investments that fundamentally transform our health ecosystems for the better. In this plenary, Dr. Rishi Manchanda maintained that there is a movement afoot to move the U.S. health care system upstream, and this movement rests on our shoulders. It’s up to us to share our stories as we traverse this path together and prove that it’s both necessary and possible to address the social, environmental, and economic factors that impact health. When he started working as a physician on the front lines in South Central Los Angeles, there was no playbook on improving social determinants of health, which led him to join forces with other stakeholders to create HealthBegins in an effort to optimize clinical and community partnerships. For providers, it’s easy to make referrals for patients with specific health conditions, but it’s much harder to make referrals for patients who lack affordable housing, live in violent neighborhoods, or don’t have consistent access to healthy food because the system is not currently set up to address these issues. That’s where community partnerships come in. Dr. Manchanda charged the audience to build collaborations that are intentional about change management and focus on the three C’s (care models, capacity, and culture). He emphasized that a true partnership transforms the people in it as they figure out how to work differently together. Effectively sharing data requires a sound policy framework. Given the constraints at various levels, how are communities, states, and the federal government addressing policy challenges? What opportunities are there for alignment at these various levels? This panel included a broad discussion of what needs to happen in order to facilitate and accelerate data sharing as it relates to community health improvement. Lauren Block shared how the National Governer’s Association is supporting state-level capacity for cross-sector data sharing through the Harnessing the Power of Data to Achieve State Policy Goals initiative and what participants are learning about governance, stakeholder engagement, and analytics. Dr. Darcy Phelan-Emrick provided a community-level perspective by sharing the Baltimore City Health Department’s legal approach for creating a real-time system to share data for falls prevention and reflecting on her lessons learned as she embarked on the long and winding path towards data sharing policy solutions. After sifting through attendee responses to the opening plenary activity, All In leaders summarized key policy themes, barriers, and opportunities that rose to the top. Participants joined discussion groups to reflect on what they learned at the meeting and made commitments to use these new tools, connections, and strategies to galvanize their work upon returning to their communities.